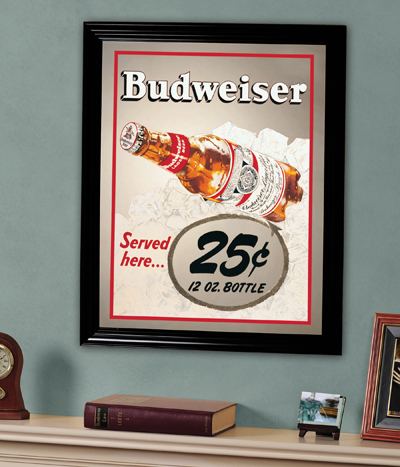 Enhance your home décor and add a splash of Budweiser team spirit with this officially licensed bottled printed material mirror from The Memory Company®. This framed mirror is boldly embellished with the Budweiser brand colors in a quality wooden frame. The mirror is a wonderful combination of design and function as the printed materials on the mirror allow it to serve its decorative and lighting purpose with little distraction. Allow this mirror to help you provide a clear expression of your Budweiser team spirit and loyalty. Measures 23” H By 18” W.